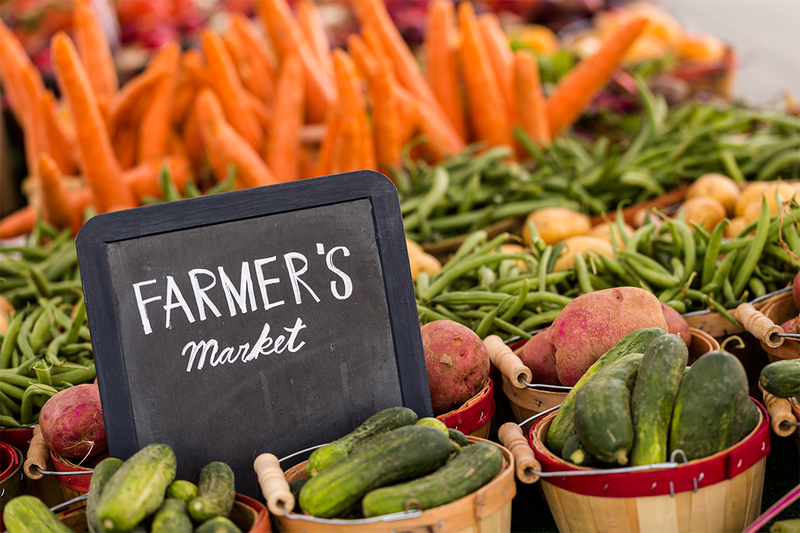 It’s time to grab your reusable shopping bags and comfortable walking shoes to go visit your local farmers market. Trading in the mind numbing task of pushing your cart around the isles of a supermarket for a morning of purchasing fresh locally grown food from the farmers market is more beneficial than you might think. Grocery stores provide the service of convenience to their customers, but that easy grab-and-go experience comes at a cost. Products in a grocery store have a “shelf life”, which is literally the amount of time that a food item can sit on a shelf before it must be discounted or thrown away. This means that foods are processed with preservatives. These preservatives alter the taste of the food we eat. Some of the chemicals used in food preservatives can be harmful to our health and reduce the nutrition our body receives by not allowing the food to break down during digestion. The farmers market on the other hand… is the best place to find fresh food. Along with the wax and preservatives that are sprayed onto the fresh fruits and vegetables in grocery store, they increase their profits by using refrigeration and delaying ripening. This doesn’t taste as good as fresh produce ripened naturally. Durning the each season you can find exponentially more flavorful fruit, vegetables, and nuts at the farmers market. There is no comparison in the quality of a freshly picked peach, melon, tomato, or any type of seasonal produce found at a farmers market. Tons and tons of grocery store foods in the U.S. are thrown away annually. Foods that extend past the “sell by” date must me thrown away. Jams, jellies, fresh baked items, cheeses, meats and more food items found at the farmers market are made in smaller batches by hand and don’t sit on a shelf long enough to be thrown out. Additionally, fruits and vegetables that grow in irregular shapes or have minor blemishes are thrown away as well. These practices result in massive amounts of waste. Buying these farmers market fruits and vegetables that naturally grow in the irregular shapes we don’t see in the grocery store reduces the market demand for “perfect” produce. Did you know that eggs from big farms can be as much as 60 days old before they get onto the grocery store shelf? Like most of the other items in a regular grocery store eggs and meat are stored and shipped for mass distribution. The protein items you find at a farmers market is the freshest you will find, outside of raising your own eggs and meat producing animals. Local honey is one of the greatest treasures of a farmers market. If you have allergies, let the bees help you build up a resistance to your the air born pollen allergy. It’s is no secret that our use of disposable plastic bags and containers has made an impact on our planet already. At the farmers market you will find less packaging and more reusable containers. You can find great deals at the farmers market on fresh food that needs to be sold! At the farmers market you aren’t paying for a brand name, the costs of extra packaging, or the distribution costs. You are just paying the farmer for their work and a great quality product. Supporting local farmers puts money directly back into the local economy. This investment in the skills of your neighbors encourages the growth of the stability around you. Having the opportunity to have a conversation with the person making and selling the fresh food you are eating is a rewarding experience. Knowing how your food is made is a great thing! Being knowledge about what goes into your body is important. Often you can find artisans who make unique hand made products at the farmers market. Much like the farmers market food, it’s tough to beat the quality of carefully crafted items made locally. Going to the farmers market is an experience that can be very different from your regular neighborhood grocery store. Your taste buds will thank you for the contrast. We want our customers to have happy and healthy homes. We hope you enjoy a trip to the local farmers market. If you or someone you know is in the market for a new home, we would be happy to help you with all of your mortgage questions. Reach out to us today to get started.